Both the JR Sanyo Line and the Astram Line get new stations this weekend with the opening of Shin-hakushima Station on Saturday, March 14. The station will link two of the city’s, hitherto completely separate, main transportation lines. According to Hiroshima City government it is estimated that 20,000 people a day will use the JR station and 10,000 the Astram Line. The local government estimates that around 8000 of those travelers will be day with switching between the two lines. The design was selected by committee back in 2012 with the contract awarded to the Tokyo and Nagoya based design firm C+A Coelacanth and Associates. 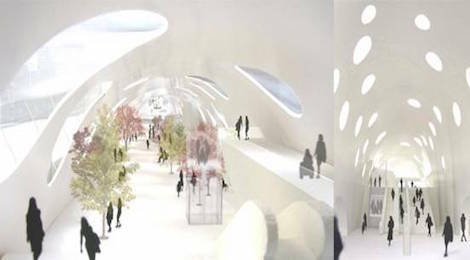 The winning proposal connected the two stations with a grand 20m wide and 10m high shell-like arched vault an creating a tunnel through which there would be a clear line of sight between the two stations. Filled with light, the sense of space was to make passengers feel like they were outside. A few months after the decision was made, however, the city announced that the design would have to be revised due to structural, safety and financial issues. The revised deign reduced the overall scale of the shell design and restricted it to covering only the stations and platforms. In the new design the route connecting the two stations would be covered where necessary with the upper sides turned into green roofs. As a result of the rethink, completion of the station was put back a full year to spring 2015. By the looks of things, workers have been working like crazy to get the station finished in time for Saturday’s opening and just a week ago the whole thing looked far from ready. Although work on the connecting passageways is yet to be completed, things were ready enough to give people a walk though last night. I haven’t found any reference to this, but I was struck by how similar the shape of the windows at the southern end of the shell are of the cenotaph in Peace Memorial Park. 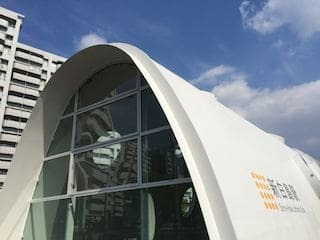 Just coincidence perhaps, but it would be a nice touch considering how close the Astram Line is to Tange’s “Peace Line”, the axis that runs through the Peace Park and the A-bomb Dome, continuing on through the Motomachi Apartment complex which overlooks the new station. Some bloggers have commented that Coelacanth’s original design relied heavily upon – and was likely selected for – it’s scale and its coherence. Both elements have been lost in the revised design. 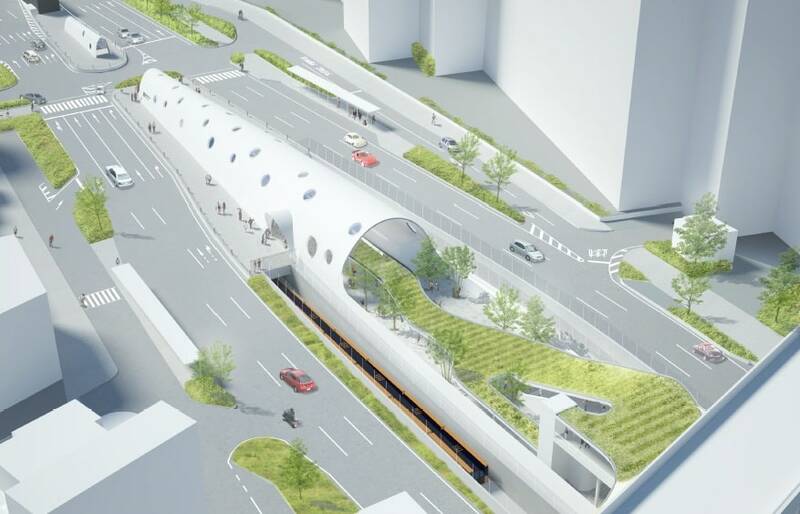 While I don’t particularly dislike the “alien pod ship” look of the shell that covers the Astram Station, I wonder how those clean white surfaces will look in a year or two. I am, however, looking forward to see if the greenery to be installed can come anywhere close to the vibrancy portrayed in the design sketches.